I got the Water Tribe mini comics, and I have sent half the comp copies to people who participated for the gallery. I'll be sending the rest next week, if all goes well. I think I forgot to contact one person. Oops! That's my brains for you. I always always forget one thing. Which I hope I don't do tonight, as I need to finish packing up for the trip to New York. Gotta bring some Avatar goodies, work, games (eh, it's a long flight). Had to do overtime this weekend in the hopes of finishing the storyboard I was working on early this week- tough luck, I finished tonight at 7pm. Ah well, at least I finished it! Not that many corrections, but a lot of little time consuming details to add, including coloring some elements so they'll read better during the animatic. The little heart skips were back- they are definitely more frequent around deadline time, so definitely stress related. And stupid me, I went and ate an espresso chocolate last night. Stupid! Chocolate, like caffeine, makes the heart more jumpy! Idiot idiot idiot!! I hope all goes well at NYCC- I'm actually rather shy, and I hope I don't make a complete fool of myself at the panels on Friday and Sunday. Eeeep!!! alisa_tana asked in a previous comment what Nauja's clothes looked like. I scratched my head, realising I only ever drew her in her coats. What's underneath, I tried to figure out. That's not final, just a first concept. But one thing for sure: layers!!! Aw man, I'm late answering comments again! I have to catch up on that. Espresso chocolate seems like an unwise choice :B It is a testament to your defiant, risk-taking character, haha! Surprisingly nice save by Zhao XD Much love for the new icon as well! Oh yes, dark chocolate, cheese...I live dangerously! Take that, heart and arteries!! Zhao can't lose all his confrontations with Nauja. His self-respect and macho attitude wouldn't survive much more beating. What a well thought out design. Always interesting to see your 'model sheets'! He was *that* close to get hit. Could it be he's slowly learning? For the panel, I wish I had those little pink pills my dad used to take when he had to speak in public. OH MAN CANNOT WAIT TO SEE YOU! Not as pervy as Arluk! *Squeee* Friday! We'll all be nervous wreck together. Ok, maybe not Dave, he's got experience with these panel things. I don't know how much wandering I'll be doing- I'll try and help the fine folks over at the Comics Bakery (booth## 2247 in the small press area), or go to some Avatar panels. You'll be a-wandering more than me! And if it is the same Appa costume as before, I am looking forward to see it in person- the pictures I saw of it were awesome!! oooh! I love your icon! It's the chibi fever. I want to do chibi icons! Zhao may not quite get his words right, but he didn't get pummeled. It's a victory of sorts. Well...minimally thought thru. As I said, I mostly thought of her coat. What's underneath, I just kept thinking "add layers, it's cold out there!" Awwwww, thank you, you're too kind. *blushes* You have some kick@$$ designs for your characters too! Ah, if only the earth as like a big supercontinent again...it would still be awfully big to cross but hey! You'd be closer :D Check the web on Saturday for goodies. someone will suely post videos of the events. I really wish I could go and see your panel, i'm sure it's going to be great! Dave Roman and Alison are to credit for doing all the work of putting the panel together. I'm just going to show up and mess it all up, he he he. Thank you- I do hope all goes well too. Good luck!! I wish I was going to be there, it sounds like so much fun! Zhao grumbles :"What does she mean, cute? I'm an admiral. I don't do cute!" Blah for stress- gotta hate it and what it does. And chocolate can't be used as comfort food. It was great meeting you last night!! And eek on heartskips! I hope they go away soon/easily/politely! Yay! Cool!! Now I'll have an alternative to roasting in the SanDiego heat. 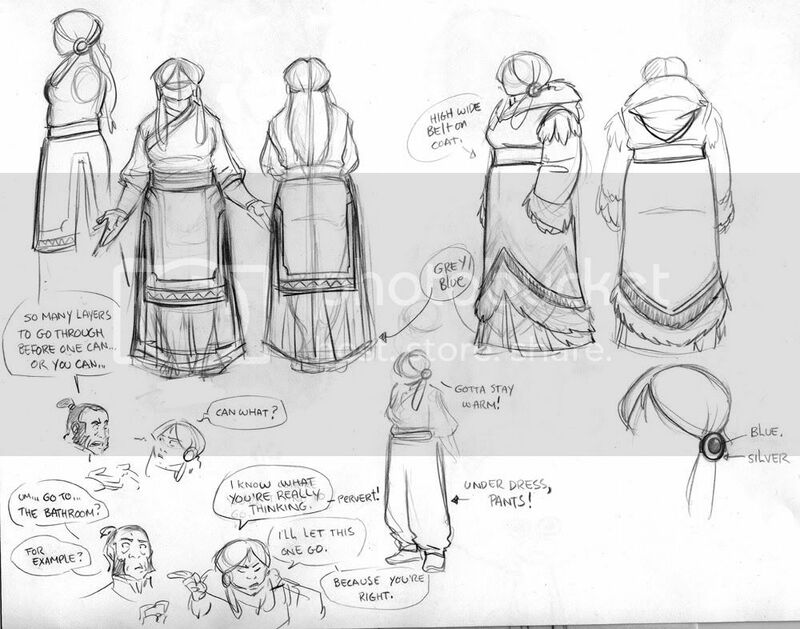 (I agree with Nauja about fire nation clothes being too skimpy!) Although that overcoat will be great for Oregon's Halloween. I was thinking about making her hair jewels out of Abalone, or at least making them look like Abalone: http://www.maikaihawaii.com/bluemoonpend.jpg just as a nice little detail. Looking foward to seeing you in NY! Ha ha- that costume is San Diego heat would kill! Oooh, the abalone piece would indeed be lovely. I mean, there is room for improvement on this thing. Whatever it takes to make it look good, even if it means changing it. Adaptation is needed between a flat, 2D drawing and actual wearing of it. Do take care of yourself! I used to have some panic attacks back when I was in school, mostly from stress, not eating regularly, not sleeping enough and not drinking enough water. (Nowadays, I'm down to merely stress and not getting enough sleep. ^^;;) Anyhow.. if your heart stuff really is happening frequently, you should see a doctor to make sure you don't have a high blood pressure issue. If left untreated, hypertension can be very serious and needs to be dealt with right away. Sorry, meant to link to onion_sama.